. Published on November 30, 2012 . Lift is a universal tool for supporting habits. It gives at least some support to any goal that can be broken down into a habit or routine. As you may be personally experiencing, everyone has at least one habit that could use a boost. For a lot of you, that’s health and fitness. But we also have Lift users trying to read more, be more generous with friends and family, talk to strangers, etc. The range of your ambitions is endless and already extends to more than thirty thousand different habits. Our challenge is to make the level of support strong enough to matter for all of those habits. When people ask us what psychology we used to design Lift, we almost always point them to BJ Fogg, a Stanford researcher of behavior design. His work focuses on how to break a goal into a habit, and then how to place structure around that habit which increases the odds of success. BJ created a framework for thinking about designing new behaviors for yourself which he calls BMAT. In the BMAT model, a behavior comes from the combination of your motivation (M), your ability (A), and a trigger/reminder (T). Using this model to describe Lift, we already do a lot for motivation. People who successfully achieve goals on Lift report at least one of these experiences: wanted to beat their previous best, felt encouraged by our positive community, felt competitive, or felt accountable. Those are all feelings of increased motivation and they’ve been enough for many Lift users to achieve new goals. 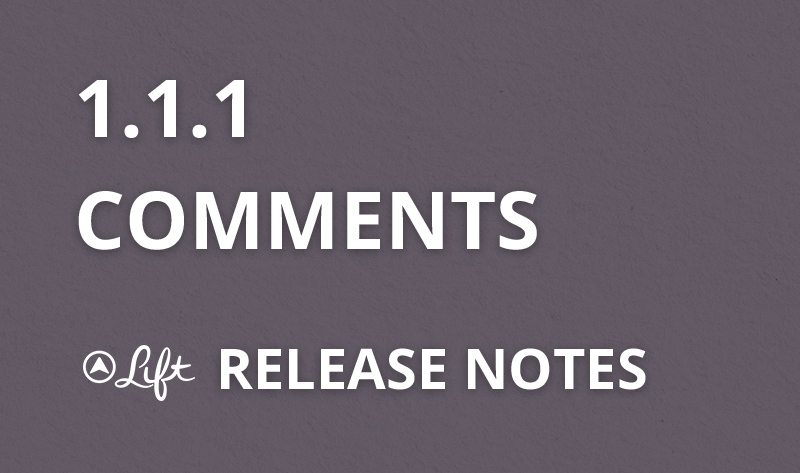 Comments is the first feature we’ve released that tackles ability. When you start a new habit, you’re impeded by missing knowledge. Which running shoes should you buy? What’s a tasty vegetarian recipe? How do you breathe during Yoga? What brand of vitamins do you buy? Now, with comments, there can be an exchange of information between members of the same Lift habit. You can ask for advice and somebody else can answer. So, that’s the long answer about why we just released comments. Of course, they’re a very flexible feature and you’re free to use them in other ways. If you have feedback or you have an interesting experience we’d love to hear from you. Send mail to feedback@lift.do, which gets forwarded to all five of us.